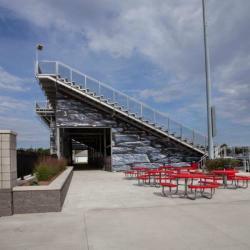 Southern Bleacher stadium fencing and stadium railings are available in a range of styles and finishes, from basic, cost-effective chain link to bold, custom designs fabricated to your architect&apos;s specifications. All of our stadium fencing and railing systems meet nationwide safety codes for height and load, ensuring compliance with all your governing laws and regulations. You can also mix our stadium fencing - choosing vertical picket rails for some areas and chain link for others - to get the most aesthetic effect for any budget. And with galvanized steel, anodized aluminum, vinyl coatings or legendary Dur-kyn paints, you can be confident that your stadium fencing or railing will be low-maintenance and built to last. Chain link stadium fencing has kept fans safe for decades and is still the most cost-effective solution. With just a minor investment, you can upgrade galvanized steel to more durable vinyl-coated stadium fencing in black or a variety of colors. Our vertical rail or picket rail stadium fencing gives any grandstand a more finished, high-quality look and feel, with options for clear or black anodized aluminum or long-lasting color with the same non-chipping, non-fading paint used by BMW and Mercedes Benz. For custom stadium railing designs, we have the expertise to manufacture materials in-house or purchase them from vendors to ensure that they meet all code requirements and attach properly to your support structure. 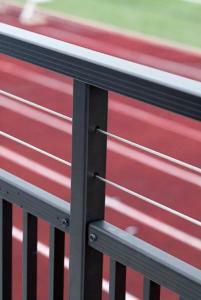 Example of a custom railing design, built by Southern Bleacher. Nothing "dresses up" a stadium like big, bold, well-planned graphics and banners. Whatever your stadium fencing, Southern Bleacher integrates graphic planning into your design and fabrication so you never have to settle for what you can retrofit to construction after the fact. Example of custom bleacher graphics, built by Southern Bleacher.